Like countless residents before them, citizens of Lansdowne and environs converged on Hoffman Park over the Easter weekend to enjoy opening of Trout Season in Philadelphia. Yet, few of the visitors that weekend for the Trout Season or even the hundreds of kids participating in the annual Spring Egg Hunt knew that Hoffman Park is an integral component of a coming Greenway supported and planned by environmental organizations, civic associations, along with state, county, and local officials. Since the development of open farmland in Delaware County over 100 years ago, county officials and municipal planners have discussed the possibility of maintaining a Greenway for the Darby Creek Watershed. From the tributaries beginning in Chester County, the Darby Creek Valley watershed drains through the densely populated regions of Delaware County into the John Heinz Wildlife Refuge and ultimately into the Delaware River. Darby Creek forms the boundary along the southwest quadrant of the borough. The county’s plan for preserving green space will include trails that connect Hoffman Park to Kent Dog Park and the Swedish Cabin in Drexel Hill to the north, and to Little Flower Manor in Darby to the south. In response to a Gubernatorial Executive Order from Tom Ridge in 1998, Delaware County released in 2010 and updated in 2015 a carefully researched plan to preserve, maintain, and develop green spaces and trails throughout the Darby Creek watershed. Through the preservation of greenspace, we are able to create recreational areas for our residents, provide more habitat to wildlife, ameliorate the effects of pollution, and also reduce flooding through natural management of storm water. As part of that plan, Lansdowne’s Hoffman Park will be connected to trails along Darby Creek to the Kent Dog Park and the Swedish Cabin in Drexel Hill to the north and extend to Little Flower Manor in Darby to the South. 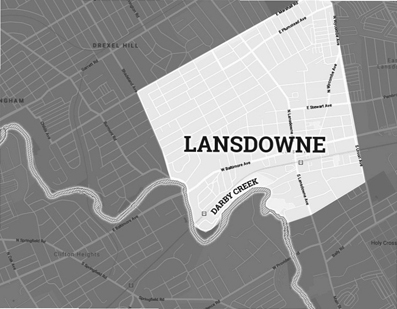 To further this plan Lansdowne Borough received a grant this past year to develop the Gateway Slope (Baltimore Avenue and Scottdale Road) to connect to Hoffman Park as part of this plan. By creating an accessible Greenway, residents of Lansdowne, Upper Darby, Yeadon, and Darby will be able to recreate along walking paths and biking trails to enjoy the natural splendor of Darby Creek and better access the historical resource of Swedish Cabin.